I almost put this book back on the shelf after I read the summary on the back. But then I thought, what the heck, and added it to my ever-growing pile of books to check out at the library. I was disappointed that Ben had a change of heart, and also that he gave Claudia such a hard time about it. It really amazes me that he thought Claudia would change her mind, like she was a child and couldn’t possibly make a decision for herself. I felt insulted for Claudia. So it was quite a surprise when she chose to take Ben back at the end, and was wondering what kind of a mother she should be. Claudia’s baby-rabies sister, Daphne, tries and fails time and time again to have a baby, and when adoption is mentioned, she looks down on it as if an adopted baby isn’t anywhere near as important as one that would come from her own genetics. Ironically, she finally adopts a baby from a young girl whom she meets in a shoe store. Claudia’s other sister, Maura, a woman with a cheating “husband” and three children, finally catches her husband in the act (well, she hires a P.I. ), but she takes him back, allowing him to stay with her and the children (though I suspect it’s more because she’s used to living in a mansion and she wants to keep her current lifestyle than anything else, despite what she says). I had such a problem with this book. Not because of the writing, because it was written well and I felt like the characters themselves were real, but because of the moral messages the book sends. I came away from the book with at least two distinct messages. First, it’s okay to keep a cheating husband around, “for the kids”, if you have some kind of proof to hold over his head and make him feel guilty as sin, just so you can keep your fabulous lifestyle. Second, having children should be the only decision; not having kids is not acceptable, and people who say they don’t want kids will “change their minds”. The only uplifting story is Daphne’s, and it’s really a bittersweet ending. Daphne, despite all her insistence that she have a baby with her genetics, finally adopts, which is an excellent message for adoptions; I was just disappointed that it was her last resort, instead of one of her first options. It was, however, a sweet ending for the girl from whom she ended up adopting the baby. 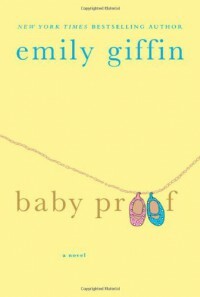 I was overall disappointed with the book, and although I thought it was well-written, there was so much focus on having a baby that the option not to have a baby seemed to fall through the cracks.